On the Morning of Wednesday, November 18, the Bossier Parish Sheriff’s Office in Louisiana received an unusual call. Caretakers at a farm in the town of Haughton had discovered one the horses stuck in a pond on the property. And this wasn’t just any horse. 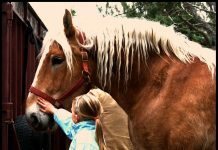 This was a Tom, a Percheron horse used for equine therapy for children and adults. The impressive draft horse is reported to weigh 2,500 pounds. Heavy rains in the area had caused the edge of the pond to become slippery, and Tom had apparently escaped from his paddock, walked too close to the edge and slid into the muddy water below. When deputies from the Sheriff’s office arrived, the caretakers had attempted to coax the massive horse out, but in spite of his efforts, the sucking mud held him fast. The deputies continued to try to help Tom to firmer footing, but the effort would require more manpower, and firefighters from the East 80 Fire District #1 were called. In the meantime, the horse’s owner had been called at work, and she rushed home to help save her beloved horse. Despite all of the help, the mud still held Tom down, and the horse was becoming more and more exhausted by the minute. Ultimately, firefighter Lee Hedgepeth waded into the pond and was able to wrap straps around the horse’s body behind his front legs. Using a tractor, the team was able to finally pull Tom up and on to dry ground. Pulling a one-ton animal out of the mud is an unusual occurrence, but all in a day’s work for emergency responders. “We do this type of thing [animal rescue] all the time. We take care of everything. But this was definitely the biggest animal I’ve dealt with,” says Plunkett. See more photos from the rescue effort on the Bossier Parish Sheriff’s Office Facebook page. This isn’t the first time a horse has gotten himself stuck somewhere he shouldn’t really be. One horse owner in Colorado discovered her horse had managed to get herself trapped in the basement. Do you have a story to tell about a trapped horse? Share it with us in the comments below. 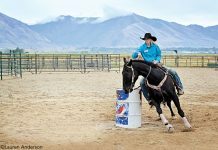 Previous articleHow Do I Teach My Horse to Tie? If more First Responders could be trained in Equine Rescue it would make incidents like this so much easier to handle. MSPCA offers a wonderful program (I’ve gone through it twice as a horse owner) that should be a model all around the country.